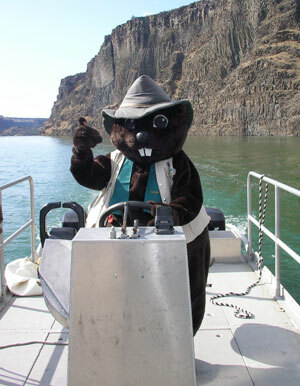 J.R. Beaver, Oregon State Park’s mascot, needs your help protecting our plants, animals and the earth’s resources. The Junior Ranger Program gives kids a chance to explore their State Parks. By becoming a Junior Ranger, 6 – 12 year old visitors, will become important park stewards. They will learn all about the park; while having fun, meeting other Junior Rangers and earning rewards. Children are welcome regardless if they are camping or just here for day-use. Parents are encouraged to stay, learn and play with their kids. Special accommodations will be made for children with disabilities wherever possible. Tools, trash bags, sunscreen will be provided. Please dress in layers, wear closed-toe shoes and bring your own gloves. Bring your bike, scooter, wagon, dog or favorite relative and show off your favorite spring spirit. All decorations for you to use provided. The parade will wind through the campground. ODFW – Free Fishing Weekend – June 1 and 2 No state/tribal fishing licenses required. June 1, 2019 is Oregon State Park’s Day! Be Water Safe at Lake Billy Chinook – Saturday, June 1 10am-12pm at the Crooked River Day Use Area (near the boat launch). Water safety tips for the whole family, fun fish activities for kids, BBQ hotdog lunch – free for the first 100 people. Special Guest – Crook County Sheriff’s Search & Rescue Team teach you and your family how to stay found! Hand outs for kids. June 2 | 2-4 pm | Crooked River Dayuse – ¡Dia de Parques Estatales Evento! ¡Nuevo en español! Únase a OPRD y PGE para una tarde divertida para toda la seguridad del agua de la familia y ez en Lake Billy Chinook Actividades para niños. Refrescos proporcionados. Bring your bike, scooter, wagon, dog or favorite relative and show off your 4th of July spirit. All decorations for you to use provided. The parade will wind through the campground. Crooked River Camp – meet at site E1. The Chamber of Commerce will be hosting the Annual 4th of July Celebration! Music in the Pavilion ~ Food Vendors ~ Craft & Miscellaneous Vendors ~ Games! Many things to do & have fun! Bring the Family! City of Redmond – 4th of July Parade Thursday, July 4, 2019 Along Sixth Street, Downtown Redmond, 10:00 am Parade route runs along 6th Street from Dogwood to Forest. Enjoy 90-plus entries, hundreds of commemorative flags posted in and around downtown, and more! Deschutes Fair and Expo Center – 11:00 a.m. to 4:00 pm This is a completely FREE event for the community! Enjoy a day of games, bounce houses, petting zoo, pony rides, live music and more. You won’t want to miss this fun-filled, family day. The Sunriver Nature Center will be out with Joe, a six year old Great Horned Owl, for a 30 minute presentation. This only happens once a summer so don’t miss your chance to get up close to a raptor! Meet at the Camp Coyote Amphitheater 9 – 9:30 am or the Crooked River Amphitheater 10-10:30 am. Travel through the amphitheater as you learn about the two railroad barons who built competing railroads side by side along the Deschutes River. Enjoy a Dutch Oven Apple Treat. That’s right, we are 60 days away from the big night. Halloween brings out animals we love to hate but is it deserved? Find out more about animals that make our spines tingle. Kids will get a treat to take back to camp. Bring your bike, scooter, wagon, dog or favorite relative and show off your favorite pioneer spirit. All decorations for you to use provided. The parade will wind through the campground.